After receiving feedback from health care providers, the Centers for Medicare & Medicaid Services (CMS) posted a press release in July, detailing proposals that would "modernize Medicare and restore the doctor-patient relationship." If finalized, these proposed changes will affect the Medicare Physician Fee Schedule (PFS) and Quality Payment Program for calendar year 2019, and give providers power to use EHRs "to document clinically meaningful information, instead of information that is only for billing purposes." Alex Azar, JD, secretary of Health and Human Services, says the proposals would help "put patients over paperwork," indicating providers could spend more time with patients and less time in front of a computer. Key points to these proposals include reducing documentation for billing purposes, focusing more on measures impacting health outcomes, changes to quality reporting requirements, payment for virtual encounters, increased interoperability, and making prescription drugs more affordable. CMS posted a 1,472-page document to the Federal Register, detailing these and other focus points. This article will summarize some of the proposal's details and consider their possible effects, if finalized, on the HIM and clinical documentation professions. CMS says the proposed changes will boost health outcomes. Included are actions involving clinicians using appropriate use criteria to determine the necessity for and type of imaging studies. In theory, this should minimize the burden on small medical practices and/or rural and geographically challenged populations by foregoing some payment and quality reporting changes and improve data exchange and interoperability to benefit patient care and engagement. In addition, the proposed changes address the various social risk factors leading to poor health outcomes. According to the Federal Register document, "Among our core objectives, we aim to improve health outcomes, attain health equity for all beneficiaries, and ensure that complex patients as well as those with social risk factors receive excellent care." Furthermore, numerous quality reporting requirement changes are proposed in relation to Quality Payment Program and Merit-Based Incentive Payment System (MIPS) quality measures. However, from a clinical documentation improvement perspective—in which quality documentation means accurate, complete, and timely patient health care stories—changes both allowing and encouraging clinicians to document less in order to receive payment for their services do not support quality care. Page 342 of the Federal Register document states: "While we propose to no longer apply much of the evaluation and management (E/M) documentation guidelines involving history, exam, and, for those choosing to document based on time, documentation of medical decision-making, our expectation is that practitioners would continue to perform and document E/M visits as medically necessary for the patient to ensure quality and continuity of care. For example, we believe that it remains an important part of care for the practitioner to understand the patient's social history, even though we would no longer require that history to be documented to bill Medicare for the visit." Clinical documentation experts question how the reduction of pertinent health care notes from patient records will result in improved health outcomes. 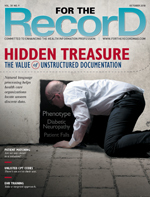 "Any reduction of documentation that conflicts with scientifically sound records-keeping is a step backward," says Reed D. Gelzer, MD, MPH, CHCC, of Trustworthy EHR. "For example, it is puzzling at best to assert more effectiveness in addressing social risk factors while also deemphasizing social history documentation. Nonetheless, a reduction in financial incentives to document unscientifically or corruptly is a step forward. In all instances it remains a professional duty of the clinician and, at the least, a legal obligation of the clinical organization, to document as much as is necessary—'burdensome' or not—to ensure quality patient care and thereby support safe, sound clinical services and programs' effectiveness." The CMS press release says that by modernizing payment policies in conjunction with streamlining health care documentation requirements, clinicians will spend more time with patients as well as increase productivity. Gelzer disagrees, citing the work of clinicians and clinical facilities in both civilian and military health services. "By conscientiously deploying and integrating new clinical information tools, [these professionals] stubbornly persist in finding ways to do their work well and spend time with their patients—never enough, of course, but sufficient to the need," he says. "It has been my observation that these clinicians and clinical organizations always have the option to decide to spend more time with patients as the priority and adapt appropriately." CMS defines interoperability as "health information technology that enables the secure exchange of electronic health information with, and use of electronic health information from, other health information technology without special effort on the part of the user," essentially making it portable. Promoted by many elements of the proposal, interoperability is directly tied to the MIPS. In fact, CMS will require MIPS-eligible physicians to employ certified EHR technology, 2015 edition, starting with the 2019 MIPS performance period. Gelzer believes such a requirement is unnecessary. "Like a growing number of people in America, I prefer we render digital clinical records-keeping secure, safe, and accurate before we worry too much about making them portable," Gelzer says. "When EHRs are built and used to efficiently originate, retain, preserve, and, when needed, produce a complete, accurate, authentic record, then this entire discussion about interoperability will probably disappear." The proposed changes may have far-reaching financial ramifications, according to Leola Burke, MHSA, CCS, an independent HIM/revenue cycle consultant in North Carolina. "The 2019 changes, if enacted, would significantly impact reimbursement because of the changes in E/M documentation and payment, widened telemedicine/virtual care coverage, or a payment structure for health technology-based communication services. If you are not using one comprehensive resource to stay on top of Medicare updates, there are chances you may miss out on some important changes. After all, staying on top of compliance requirements with EHR is key to getting the correct reimbursement and advancing digital health technology," she says. Still, the proposal's effects on health care providers are unknown. It's possible some physicians may be reimbursed less for their services. This appears to be particularly pertinent to specialty practices that usually bill higher-level E/M codes. "If you are a specialty practice and you bill a lot of 99214s and 99215s, the proposed payment they [CMS] are going to offer is probably lower than your current rates," says Kathy Burke, CPC, CPB, coding manager at Tucson Medical Center in Arizona. "If you're a primary care physician where you do lower-level care routinely, you might be making more because the average payment that they [CMS] choose to pay for all of those together may be slightly higher than what you typically bill for a 99212 or 99213. So, if you are a practice that skews toward the higher end, you're going to make less; if you generally skew toward the lower end, you are probably going to make more." As a result, it's difficult to understand how the proposed changes will result in greater face-to-face time with patients when some physicians must see more patients to counteract their reduced CMS reimbursement. It is even possible more clinicians will refuse to see Medicare patients, reversing a recent trend. Still, the proposal maintains that "Removing unnecessary paperwork requirements through the PFS proposal would save individual clinicians an estimated 51 hours per year if 40% of their patients are in Medicare." Should this occur, it could benefit health care providers in their clinical practice. Neither the press release nor the Federal Register document specifically addresses the business practice known as HIM, nor do they make reference to HIM operations, coders, or the documentation integrity workforce. That said, the proposal's effects on the HIM industry are speculative and may evolve slowly. Depending on how quickly clinicians update their documentation practices—and whether those changes remain in the clinical setting or expand to hospital medical records—not only could coding, billing, and reimbursement be affected but so could every aspect of HIM operations and documentation integrity. As for the probable effects on coders, Kathy Burke says, "Life is going to get really challenging." After reviewing the CMS press release and researching the Federal Register document as well as gathering input from industry professionals, it's fair to question whether the claims CMS is making can be realized if the proposed changes are finalized as written. There is legitimate concern about the effects the proposed changes would have on the HIM and documentation professions. Certainly there is benefit to reducing the amount of information required for billing purposes. However, it appears CMS is proposing to make documentation that is critical to telling the patient's story irrelevant and unnecessary to the medical record. The health care documentation profession believes that elements such as the social history and medical decision-making are as vital as all other elements of the medical history. While health care documentation is used for coding, billing, and reimbursement, it's also a vital tool for many individuals along the care continuum, including patients themselves. It is the hope that CMS bears this in mind. — Patricia (Patt) King is manager of HIM transcription for Tucson Medical Center in Tucson, Arizona. King was cochair of the Back-End Speech Recognition Implementation Best Practices Toolkit in 2016, was cochair of the Healthcare Documentation Quality Assurance Management and Best Practices Toolkit in 2018, and is currently the District 1 director and president-elect for the Association for Healthcare Documentation Integrity. — Although in a wheelchair from the birth defect spina bifida, Brenda Wynn, RHIT, CMT, AHDI-F, has been working in the health care documentation industry for more than 18 years, most recently as a QC editor for Nuance Transcription Services. She's involved with several Association for Healthcare Documentation Integrity (AHDI) committees, including the Ethics and Research & Development Team, as well as the AHDI Advocacy Alliance Task Force. She obtained her RHIT in December 2016.